I've put this together to make TDS blueprinting nice and easy. Enjoy! This is great thanks for the upload. Pickup, Death animations added to the to-add list. Probably will be added last given they will have to be hand-drawn. Good suggestions! 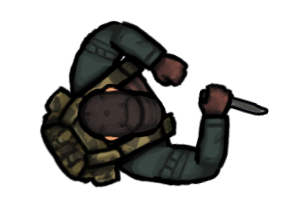 I'll add a knife w/animations and a flashlight. 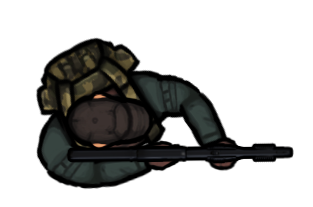 Added Rifle + Shotgun animations and also increased the frame rate for smoother animations! Oh nice, your additions are looking peach. I've been thinking what else you could add, and with the flashlight, maybe a reload animation to change batteries could be added? 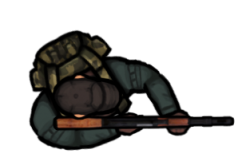 Or melee animations with the flashlight or guns? Maybe I'm just getting excited. Ooh - melee options with the guns - I'll see how that looks in spine. Knife and flashlight incoming. Added Knife Animations, Flashlight Animations, and melee attack animations for every weapon! Enjoy! I've been working on a top-down zombie shooter and this is exactly what I needed, thank you for doing such a thorough job with all the different animations! Do you have any plans to make zombies/monsters or items? Reskins and zombies are on the way. What kind of items are you looking for? Could you expand on what you're looking for? Huh...it seems to be working fine for me when I download it from here? I've reuploaded it - just make sure to unzip it. Background textures and environment are in the works! 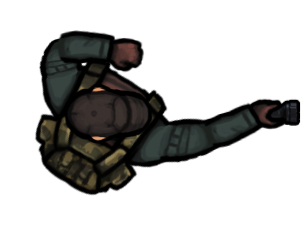 Might I also suggest a Survivor animation set where they are holding nothing, if possible? Thanks - and I can see what you mean with the stance - I'll work on it. The plan was to slowly trickle more matching assets like this matching this style so that they could be used. Next up is a few zombie variations. Then I'll think about adding specials. @Eslchr - I'll add that. @rileygombart Some useful items could be sprites of the weapons that could act as weapon pickups in-game, or some environmental objects like top-down crates, barrels, health packs, a top-down door that opens and closes, just some generally common objects. Maybe an NPC that is unarmed? Beggars can't be choosers and I'm grateful for all the assets you've created so far, above and beyond most entries on opengameart! I put a quick demo together with a couple of your graphics (shotgun and zombie). Go to my site - here - and take a look. Hey Riley this are great, I'm using this art in my game. Are you still planning to post new zombies? Or a death animation to the existing one? But why there isn't a "no gun or weapon" sprite? And if you are still making thse, a "driving" would be nice. Incredible!! are you still working on this?? thank you very much :) and keep up the good work! cant open the file, an alert with the text cant be opened becouse of a problem with the content appears :'( any advice? This is beyond amazing! You're extremely talented!! Nice work, think maybe you could add animations for a RPG? You have no idea how much I love your content, you're amazing. I'd love to see animation for an RPG or bombs (anything that can make area damage). Hey, I'd like to use this in my game, and I was wondering, do you have an Isometric view of all these same sprites? Hey Riley, this art is awesome! I understand the license you have provided - but also wanted to reach out and personally ask you if I could use these graphics in a game I am making. I'll post a video of the project shortly when it is ready and gladly credit your work on the art assets for the player. Do you also have the spine animation files? Thought I would comment back and share the video of my project using this art. Not sure if you still check in here or not Riley, but if so I'd love to hear what you think and get your official blessing to use this. The art is awesome, I love it! Thanks for the great response! Due to popular demand, I'll zip up and attach the spine files and json files for use with engines that support Spine animations. Amazing news! You're a champ. I have attached the Spine source files for you guys to use. Apologies for taking so long, folks - my year got insanely busy and I just forgot about this until now. Hopefully, someone can use this! Hi, I want to offer you to participate in the creation of my project! Write me! It is an amazing work! Can someone please export the animations to a .json file? Very nice set, it perfect completes (or help to make your own templates) the "TopDown AI" from same developer on Unity Assets Store. This is amazing! you have inspired me to make a game! Great work on these assets. Keep up the awesome job!